Ok. So I know I just did issue #83. And in truth this could have been the next one in, some of them are in order, most are not and I pick randomly. 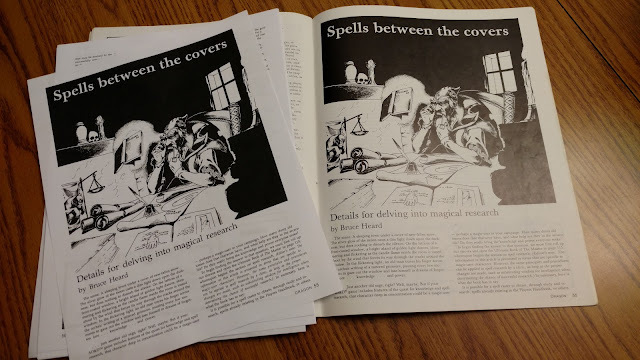 But I did choose this one on purpose for the Spell Research article. More on that in a bit though. In truth this was the one right next to #83. So let's get to it. Put your VHS of Cronenberg's "Videodrome" on and curl up with This Old Dragon Issue #82. Ever wonder what a "Dancing Sword" looks like? Well this issue's cover might give you a good idea. Or it is a magic spell being used by the wizard in back. So let me think. February of 1984. I would have been a freshman in high school. I had already moved over to AD&D proper by this point but was still using the "Known World". I knew of Greyhawk, of course, but didn't have anything for it yet. In truth I was not doing much at this point since I had just come off of a 16-week sickness due to pneumonia. I had in this time read all of the Tolkien books that were out of the time and watched an obscene amount of Doctor Who and Space: 1999. Moving on...Letters covers mistakes or typos from issues. Big ad for the Dr. No supplement for the James Bond game. 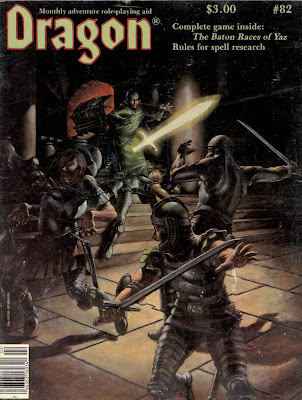 The Forum covers some details about Ed Greenwood's Nine Hells Revisited articles (cant' wait to do those!) namely what to do about Lawful Evil gods. Still a good question really. Nigel Findley is up for our first proper article, The Ecology of the Peryton. My memory is fuzzy, but I do remember that this is one of the first Ecology articles I ever read and it was also one I really liked. It really made this creature into something more than a collection of stats and a weird picture in the Monster Manual. Note that this Ecology article is not by Ed Greenwood. Still, it is a fine read. I challenge anyone to reread this and NOT want to use a Peryton in your game. 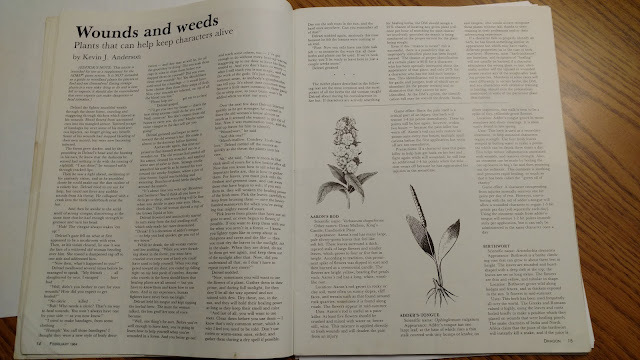 Wounds and weeds, Plants that can help keep characters alive is an AD&D game herbal from Kevin J. Anderson. As expected it has a warning not to try these at home, these are AD&D game stats only. What follows are six pages of various herbs, with some pictures, that have some uses in the game. These are various healing herbs that work when magical healing is no where around. I think this is a good addition to any Druid or Witch class since healing magic is not their prime focus. While long, even at six pages it feels short. Maybe because I have seen other articles and books like this that were much longer. Enhancing the Enchanter by Craig Barrett is for the DRAGONQUEST game. DQ was always "one of those games". I saw it all the time at the bookstores and in Dragon, but I knew very little about it. I picked up many times and flipped through it. It looked complicated (to me, at the time) but more to the point I didn't know of anyone playing it. Did you play this game? The article is largely rule changes. At five pages it is also a longer article. 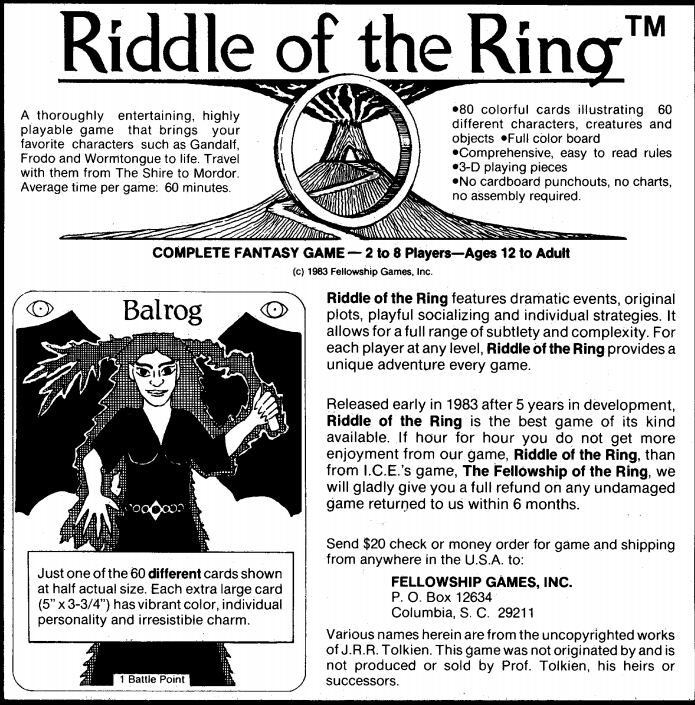 We get another ad for "Riddle of the Ring" card game. I share this because I KNOW no one ever thought the Balrog looked like this. Speaking of rings. Up next is an article about a baker's dozen of magical rings. Rings that do weird things: Thirteen pieces of jewelry not from the DMG. 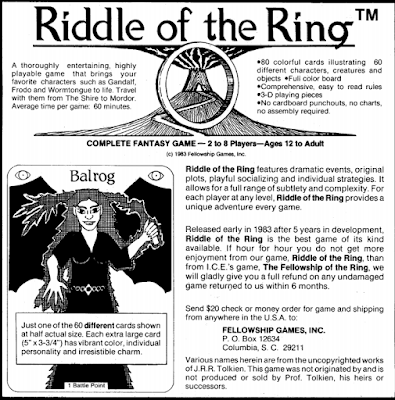 All these rings are by various authors (two by Ed Greenwood). The Ring of Bladeturning eventually had to be banned in my games. New Avenues for Agents is a preview of the Top Secret Companion. I never was really into spy games. Again, I'll admit a certain curiosity to play the James Bond game and I tried the Spycraft d20 game back when it was new. But overall they never really grabbed me like fantasy or horror games do. Our centerfold is a full game, The Baton Races of Yaz. It looks like a kid's game. Certainly that is true, but I have watched people bid on that old boxed set of the "Dragon Magazine Games" and people really seem to love it. I should point out that my copy does not have this. 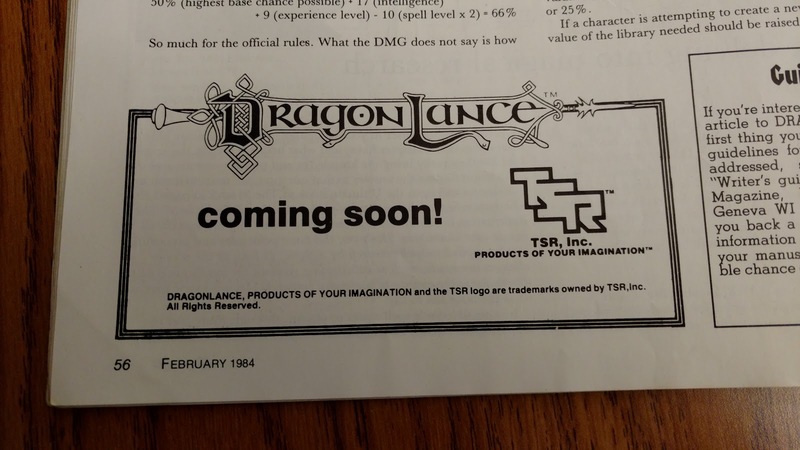 I only know about it because of my Dragon CD-ROM. Curing the Monty Haul Malady by Roger E. Moore deals with a common problem of most D&D games. The article is an edited version of some letters that have come in. Some of the examples given I just can't really take seriously; "He decided his character would kill Orcus, and after that his character became the new prince of the undead, with an unlimited amount of any undead to control, even an unlimited number of liches. The character also has some star destroyers he uses to fly around in space or to destroy planets." Yeah. This was the 80s. Sad to say...but yes I knew a guy that claimed his character had a Star Destroyer. Not a Star Wars character, a D&D character. While we were encouraged to not go to crazy high levels, there was nothing in the rules to stop you. Tim Kask's warnings in "Gods, Demi-gods and Heroes" read more like a challenge I think to many. future editions of *D&D tried to make these limits more ingrained in the rules; usually stopping at 20th level (or ~30th for BECMI and D&D4). But gamers will be gamers I guess. A review of battle mats, dice towers and the "Dragonbone" computerized dice roller. I always kinda wanted one of those, but every DM I ever had said they would not allow it. Also rolling dice is still the best. I still have and use a battle mat though. Spells between the Covers is the big reason I grabbed this issue. +Bruce Heard does a great job of filling some of the gaps in our knowledge on how to do spell research. While I think many players know now many of the points made here, this article did not have the benefit of years of the community playing Call of Cthulhu. In that game a good occult library is worth more than gold and more dangerous than plutonium. Speaking of dangerous. This magazine's mildew is getting so bad I am switching over to a print out from my CD-ROM. The costs associated with building a library really should hold up edition to edition. There is a lot of great stuff here about purchasing books. BUT the REAL treasure is the list of books and the sages that wrote them. Here is a brief sampling that NO real wizard, mage, sage or occult scholar should be without. And many more. Really worth the price of the magazine alone if you ask me. Tips on appraising the books, special books and cursed books are also discussed. Looking over the list it is dominated, naturally, by Greyhawk wizards, though Elminster is there too. Even then Elminster had a better publishing deal! This is also tucked away in a small corned of the article. The fiction section is Windowolf by Earl S. Wajenberg. We get some ads. Namely these two. Yes. I will admit to own both that game and that dragon claw amulet. Once again...it was the 80s. We end with the comics. Once again one of those rare issues with Wormy, Snarf Quest and What's New all in one issue. This was another big issue and maybe one of the reasons we look back at this time with such nostalgia, or at least with the rose-colored bifocals of the 40+ something gamer. Want to know what I was saying about White Dwarf at the same time? Check out White Dwarf Wednesday #50. Definitely the spell Mordenkainen's Sword. Which I still have yet to see in play, because it's 1) high level and 2) fairly niche in its usefulness (vs. most corporeal targets, a basic area effect evocation is usually more efficient). The Dragonbone was kind of overrated, it worked, but it's much more fun to just roll dice. Wait, was the Kevin J. Anderson the one who would go on to write questionable Star Wars and Dune novels? And what IS Witch Hunt like, anyway? I was always tempted by both that and Night of the Ninja, but never ordered them and have never seen them in real life. I finally finished reading this today. So much good stuff in this issue. I need to finish about five books and then I can move on to my Dragon and Fight On! magazines. Just started playing in a DQ game. It comes across as GURPS streamlined for fantasy. Like most games from that era that use skills, your character is barely competent at the start and it takes forever to grow in competence. Halfway decent at swinging a sword? Then you'll probably cut yourself if you pick up an axe or a knife, and don't even think about riding a horse or trying to sneak anywhere. Most GMs circumvent this by giving you a handful of skills off the bat, so your character is competent-to-heroic from day one. Oh! Also, my parents mistakenly bought me DQ's version of a DM's screen for Christmas one year. It had a really-bad-wounds table that included an entry in which your character acquired a scar that "ruins his boyishly-handsome good looks." @Deadstop: Witch Hunt (and its one published adventure )is a pretty gritty little game, that's strongly based in the historical Salem witch trial accounts. 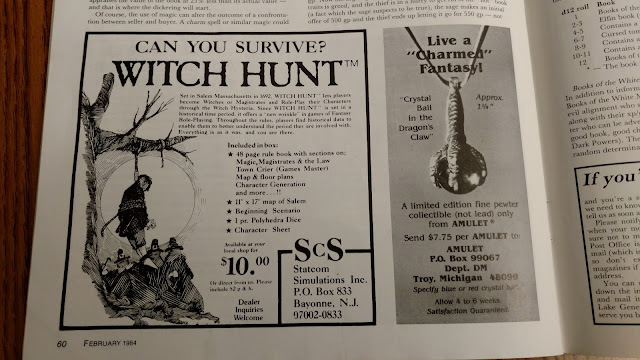 I have used it to help form the basis for a Call of Cthulhu historical scenario for the Salem witch scare, but not played the Statcom game/system itself.